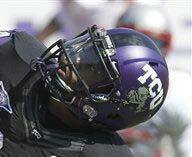 TCU's predominate leather football helmet look. Dates are uncertain. In 1929, photo evidence shows that TCU wore light colored or white colored leather helmets. 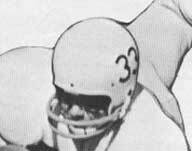 A classic helmet design worn by TCU for much of the 1940s and 1950s. 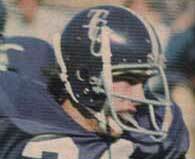 Great players such as Jim Swink wore this helmet. Dates are uncertain. Purple helmet, white stripe, gray facemask. Only addition was the facemask. Purple helmet, white stripe, white player numbers on sides, gray facemask. Player numbers were added, which was similar to most other schools at this time. 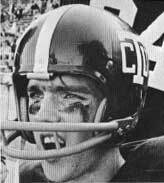 This is the helmet that TCU wore for most of the 1960s. A very "blah" design overall. 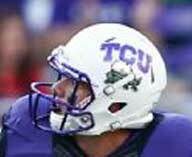 Purple helmet with white stripe, white solid horn frog on sides with TCU in purple on the inside of frog, gray facemask. This helmet was worn for only one year, but was a vast improvement over the plain white helmets. Purple shell with white stripe, purple and white "cartoon" hornfrog head outlined in white, gray facemask. Neat idea in incorporating the horn frog on the helmet. The horned frog would finally return in 1998. Purple shell with white stripe, white cTu on sides (similar to Texas A&M's design), gray facemask. Interesting concept of the TCU lettering on the sides of the helmet. Too bad this was only used one year. Purple shell with thin white-purple-white stripes, white player numbers on sides, gray facemask. A one year "experiment" before returning to the bland white helmets with purple player numbers. White shell with purple player block numbers on sides, gray facemask. 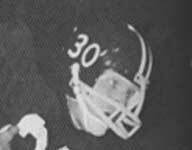 Very plain look, this helmet was almost an exact copy of the helmet the Frogs wore in the early 1960s, except the number were of a "block" typestyle. 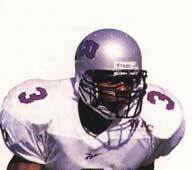 Silver shell with purple stripe and purple staggered "T" "C" "U" in a Times font, gray facemask. 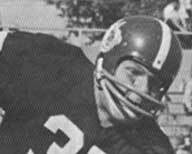 A nice looking helmet, instituted in the first year of coach Jim Pittman, who died tragically in mid-season of 1971 of a heart attack on the sidelines of the Baylor - TCU game in Waco. Purple shell with white stripe and white staggered "T" "C" "U" in a Times font, gray facemask. 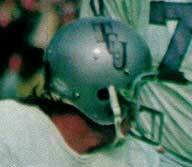 This helmet was an update of the helmet worn by the Frogs from 1971-73. 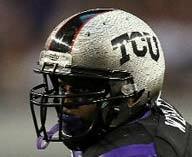 TCU wore this helmet during the tenure of Jim Shoffner, and unfortunately, one of the worst periods of TCU football, with the Frogs winning a total of 2 games in this three year period. Silver shell with purple TCU on sides, with the T extending out over the CU, gray facemask. 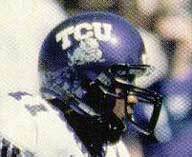 One of TCU's most popular helmet logos began during the tenure of Coach F.A. Dry. 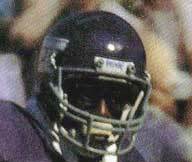 This helmet was worn until the Texas Tech game of 1980, at which time the shells were painted purple. Purple shell with white TCU on sides, with the T extending out over the CU, gray facemask. 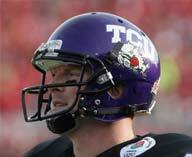 This helmet was a one week transition helmet, worn during the TCU - Texas Tech game in Ft. Worth. 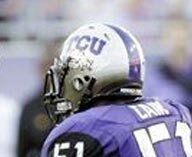 Coach Dry stated at the time that the reason for the change to purple helmets was that all championship TCU teams had worn purple helmets. The gray facemasks were a holdover from the silver helmets, but would shortly be replaced. Purple shell with white TCU on sides, with the T extending out over the CU, white facemask. 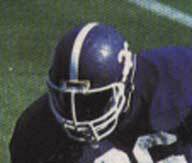 Starting in the Texas game in 1980, TCU "finished" the look of this popular helmet by adding a white facemask. 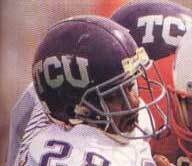 Barring a brief change in 1982, this helmet enjoyed the longest tenure of any TCU helmet; 11 1/2 seasons. Coach Jim Wacker immediately changed back to this look after taking over the TCU helm in 1983. Purple shell with white player's numbers on sides, white stripe, white facemask. For some inexplicable reason, Coach F.A. Dry changed to these ugly helmets 2/3 of the way through the 1982 season. They were worn on the road in the Houston game with purple pants, which may have been a one game event. Purple shell with silver arched TCU on sides, gray facemask. This helmet was worn only during the first year of Coach Pat Sullivan. I consider this a "transition helmet", as it used the previous year's shell with Sullivan's new TCU logo design. Actually, not a bad helmet look. Silver shell with purple-white-purple stripes, arched TCU in purple outlined in white, and gray facemasks. Evidently the look that Pat Sullivan wanted, this helmet is okay in design. 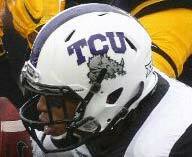 One complaint is that the TCU on the sides is placed too high on the helmet and is way too small. Silver shell with arched TCU in purple outlined in black on sides, black facemask. A real puzzler! 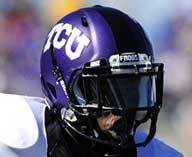 For some reason TCU decided to trim in black, and incorporated that look into the outlined TCU and the facemask. 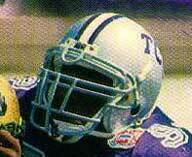 Metallic purple shell with TCU in white and gray horned frog outlined in black on sides, black facemask. 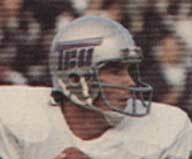 Perhaps the best looking TCU helmet in the modern era was instituted under Coach Dennis Francione. Could be a classic look, with the horned frog added to the side for the first time since the early 1960s. 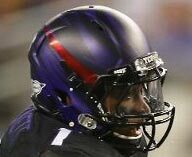 A purple facemask would probably look better (what's with the black fixation? ), but overall, a GREAT looking helmet. Unusual metallic silver and black flaked horned frog skin stylized shell with large TCU in white on sides, large tapered black stripe in middle (from wide to thin, front to back) flanked by thin red stripes, black facemask. Brand new look unveiled on November 14, 2009 against Utah. Made by Nike, called the Pro Combat line (with new uniforms). Very unusual new look. Worn twice in 2009, including the Fiesta Bowl. Red stripes on the helmet signify the blood that real horned frogs shoot out from their eyes. Ugly helmet overall, with no purple. Light metallic silver and black flaked horned frog skin stylized shell with TCU in black on sides, large tapered black stripe in middle (from wide to thin, front to back) flanked by thin red stripes, black facemask. 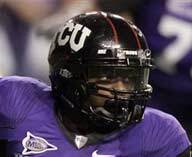 2010 Nike Pro Combat helmet for TCU (with new uniforms). Lighter "ice" silver shell and black TCU lettering the big changes from last year's model. Red stripes on the helmet signify the blood that real horned frogs shoot out from their eyes. An improvement over the 2009 combat helmet, but still no purple on the helmet. 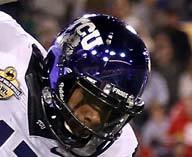 Metallic purple shell with TCU in white and gray horned frog outlined in black on sides with rose in teeth, black facemask. TCU added a rose to the horned frog decal for the 2011 Rose Bowl game, a win against Wisconsin. TCU finished 13-0. Metallic purple matte finish shell with simulated "horned frog skin" texture, stylized TCU in white with thin black outline on sides, thick black stripe, black facemask. Another Nike Pro Combat type helmet introduced in 2011. This version does not have the horned frog on the sides. Metallic purple matte finish shell with simulated "horned frog skin" texture, TCU in white and gray horned frog outlined in black on sides,wide black stripe, black facemask. Traditional horned frog helmet has been updated for 2011 with the wide black stripe and matte purple finish. Light metallic silver and black flaked horned frog skin stylized shell, TCU and horned frog in white outlined in black on side, black facemask. 2010 Nike Pro Combat helmet used for the first time with an altered version of the current TCU horned frog helmet decals. Just by looking at the helmet, one would be hard-pressed to know that TCU's school color is purple. Light metallic silver and black flaked horned frog skin stylized shell, TCU in purple and horned frog in white outlined in black on side, wide purple stripe, black facemask. 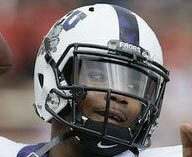 One of the new helmets for 2012 is similar to the Nike Pro Combat helmets of the past two seasons, but with a TCU in purple and white purple stripe. New HydroChrome purple helmet with TCU in white and horned frog in silver outlined in black on sides, black facemask. New HydroChrome finish helmet for 2012 used in at least two games. Also worn as an alternate helmet currently. Matte finish purple helmet with black strip highlights and red stripe on each side (simulating the blood of the eyes of a horned frog), with TCU in white on the back of the helmets, black facemask. Lots of black on the helmet. 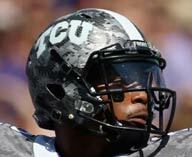 Very unusual design with blood red on helmet to signify shooting blood from horned-frog's eyes. White helmet with TCU in purple and horned frog in silver/black on sides, purple facemask. Nice alternate helmet for this season; uses solely the school's colors with no black. 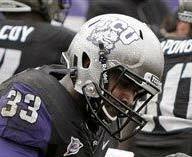 White helmet with TCU in purple, black-purple-black stripes, and horned frog in silver/black on sides, black facemask. 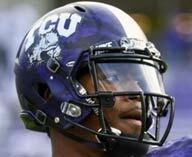 For some weird reason, TCU has 2 white helmets now for 2014. This one features stripes and a black facemask. Worn again in 2015 and 2016. Purple horned-frog skin shell with TCU in white and horned-frog in silver/black on sides, wide white stripe, black facemask. New look frog-skinned helmet (1 of 3) for 2015. Gray horned-frog skin shell with TCU in white on sides, wide white stripe, black facemask. New look frog-skinned helmet (2 of 3) for 2015. Gray is not a school color, but at least it is not black! White shell with TCU in purple and horned frog in silver/black on sides, wide horned-frog skin purple stripe, black facemask. New look white helmet (3 of 3) for 2015.